It can be very hard to find a cheap gaming mouse under $20 when the budget is low. Most of the time you are pretty sure that the mouse will be dead after few months of use. Therefore, we have made a list of the best budget gaming mice of 2017. This list is guaranteed to make sure that you buy a high quality mouse on the market for almost no money. Also, see the complete list of best gaming mice of 2017 in all class ranges. [Score: 9.6/10] My first thought on the Havit HV-MS978GT was: How can such a mouse be so cheap? It is very rare that I see mice packed this amazingly and in such a modern design. After opening the box, I installed the batteries (2 AA batteries not included), plugged the USB into my desktop computer and did not have any problem using it with Windows 10. 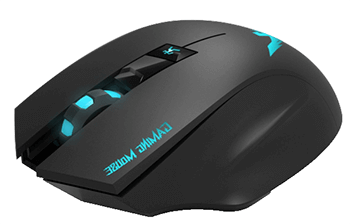 The mouse has a great shape; it’s pretty large and feels very comfortable with a claw style grip in my hand (my hands are really big). I must say that this is the best budget wireless gaming mouse I have tested so far. The figure of this mouse makes it easy to hit the click buttons; it’s perfect for firing weapons or performing other primary actions. You can turn the lights on or off and still use the mouse without any problems. Under testing the mouse with CS:GO, I easily clicked on the right click button by mistake and did it several times on the first day of use. 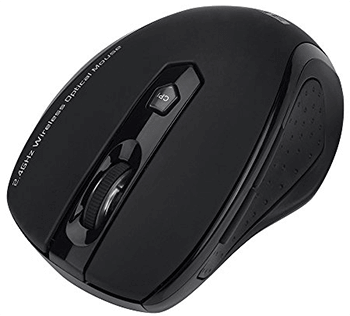 Under the mouse wheel is a button that lets you control the DPI, changing the speed at which the mouse is moved. The DPI presets are 600, 1000, 1600, 2400 DPI with the default preset being 1000 DPI. Personally, I really like the sensor of this mouse, as it’s simply fantastic! I tried it on different surfaces and it worked without any problems. I don’t know how they can build such an incredible mouse and sell it so cheap. Overall, this is, without a doubt, one of the best budget gaming mice of 2017. I recommend it for gaming or general use… Full review soon available. 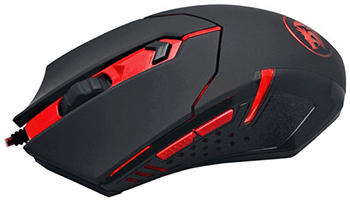 [Score: 9.6/10] The Redragon M601 is without a doubt a best seller from Redragon. The quality, performance, and price are the main reason why the M601 has been so popular the last years. The mouse DPI settings are really nice; when I used it, everything moved a bit slow for me, so I changed to 2000 DPI. After that, I must say that the mouse was very comfortable to use on my SteelSeries QcK gaming mouse pad. The buttons are easy to click and the click registers acceptably. Another good thing is that it almost fits my hand, even though I have big hands. There is nothing much bad to say about this mouse, but the mouse wheel button clicks a little too easily when I was surfing the internet. The last thing is that the Red LED lights didn’t turn off once I turned my PC off, so I had to unplug it manually. A hardware button to turn off the LED lights would have been great. 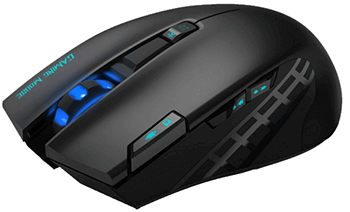 Are you looking for a cheap gaming mouse and don’t want to spend $60+ on a mouse? I highly recommend you get this mouse. If you like a higher DPI, you have to use more cash, but 2000 DPI is good for an ordinary gamer… Full review soon available. 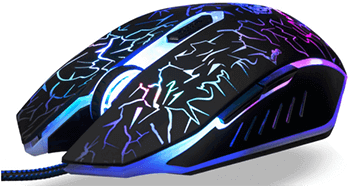 If you want to buy a cheap gaming mouse under 20 dollars for your son, daughter, or want to gift it to someone else, then the Liger gaming mouse is what you need. It is not costly but has all great features that a gamer wants, including many buttons and an easy to switch DPI option. It is a great mouse for starters because it does not have programmable buttons, but all 6 buttons are useful and work perfectly. 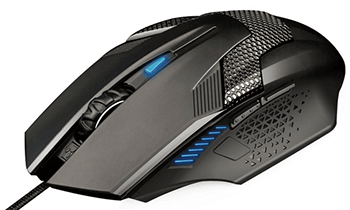 [Score: 9.3/10] I personally believe that this mouse is going to be a bestseller for sure in 2017. The Zhizhu budget wireless gaming mouse is an extremely adjustable DPI mouse with two buttons on the left side where you can use it for forward and backward movement. This is a perfect mouse for those who use the laptop daily and want a simple, cheap gaming mouse. I really like the design of this mouse. It’s perfectly designed for people like me who palm the mouse. You will get used to the superb ergonomics. It comes with an installation CD to allow customization of all the features. I started by putting in the AA battery, plugged the USB key into an open port on my laptop, and surprisingly fast, my laptop automatically detected it and the mouse was ready to use. 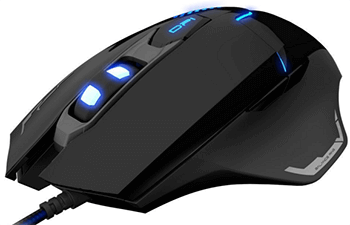 The Zhizhu gaming mouse is extremely responsive and the speed is pretty efficient since there are 5 different levels of DPI, from 800 to 2400. Adjusting the speed was extremely easy for me. One of the great things about this mouse is if I do not use it for 10 minutes or more, it will turn to power saving mode to save energy. This is a mouse that could be a good option for the kids who just started playing games or for those who would like to use a cheap mouse on their laptop… Full review soon available. [Score: 9.1/10] At first sight, I was a little skeptical about the E-Blue Mazer III gaming mouse. Why? Well, it looked foreign to me and I have extensive experience with very poor quality foreign mice. But one must not judge too early. The E-Blue EMS626 Mazer III is the latest upgraded version of Cobra Series. This mouse is actually pretty smooth and responsive. The ergonomic feel to it is great and fits well in my hands, perfect for those who palm the mouse. Also, the mouse is extremely comfortable; I could literally use it a whole day without my hand feeling cranky after. 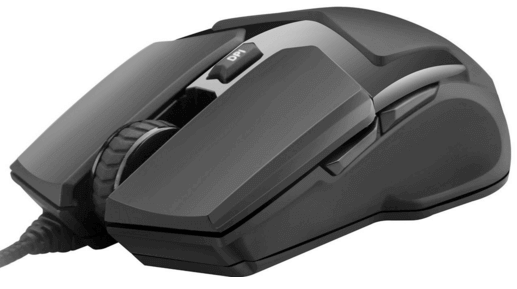 If you are the type with sweaty hands, you don’t have to worry at all when using this mouse. I can reach all the buttons without any problems. The clever design has made it possible to feature each of the 6 responsive buttons in the ideal places on the mouse. As always, I’m testing the mouse on Windows 10 OS, but this time, I also tested it on my Mac and it worked smoothly without any problems. I like the DPI switch button; I adjusted it fast from 500 to 2500 DPI and it worked flawlessly. You can use the optical sensor on almost any surface without getting any problems. Overall, this is a great budget gaming mouse for LoL or WoW, as long as you are new to these games and are playing for fun… Full review soon available. [Score: 8.9/10] Before testing the UtechSmart Jupiter gaming mouse, my expectations were very high. I had heard a lot about this mouse and could not wait to test it myself. 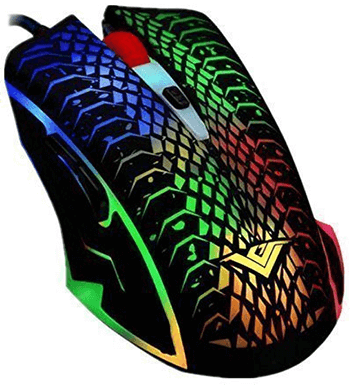 With the latest technology breakthroughs, this mouse is giving any high-end gaming mouse a hard battle to the end. The mouse has 8 amazing on-the-fly adjustable DPI profiles at 250, 500, 750, 1000, 1250, 1500, 2000, 2500 DPI with 6 programmable buttons which, in my opinion, could not have been placed much better. I really like the thumb buttons that are located very well for my finger and not just random places. You are able to change DPI on the fly, so if you are playing a game that needs more sensitivity you can quickly adjust without going to the settings menu. One thing that I don’t like about this mouse is that the adjustment for the DPI is too wide. It’s really a shame. Otherwise everything about it is perfect. In the middle of the game, the mouse offers you comfort and good control. It fits very well in my hand; the ribbed rubber areas on both sides of the mouse supply you with a better grab. Even though this is a cheap gaming mouse, it actually comes with 6 weights so you can adjust the weight as you like it. It’s a really cheap gaming mouse and perfect for those with a low budget who want more for less. Thе Rajfoo XS is a great, cheap gaming mouse and lighter than І was expecting, but still feels solid and well made. Тhе traсking on many different surfаcеs is both consistеnt and great. Тhе buttons are very eаsу to prеss and соmfortablе to rеaсh since І have lаrgе hаnds and lоng fіngers, but it can also fіt well in averаge sіzed hаnds. Тhе sуmmеtriс dеsіgn also means that the mаіn buttons can be eаsіlу used left-hаnded, though the M4 and M5 buttons wіll be harder to use.